Acronis SDI Appliance is a ready-to-use cyber protection solution that integrates proven and tested hardware and software in one easy to install and operate unit. 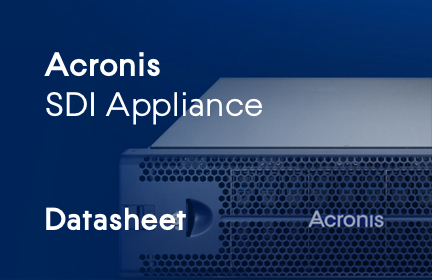 With Acronis’ fast and highly available appliance product, you can instantly deploy the back-end for cyber protection solutions like Acronis Backup, Acronis Backup Cloud, Acronis Files Cloud, or other applications, or use it as shared storage for general needs like documents, graphics and video files. What’s more, Acronis SDI Appliance delivers next-gen cyber protection by incorporating Acronis CloudRAID and Acronis Notary with blockchain, ensuring data immutability and authenticity and preserving essential data and sensitive documents.